Gudrun talks to Jousef Murad about the computing platform SimScale. Jousef is currently studying mechanical engineering at the Karlsruhe Institute of Technology (KIT) and focuses on turbulence modelling and computational mechanics in his Master's studies. He first learned about the existence of SimScale early in the year 2015 and started as a FEA (finite element analysis) simulation assistant in November 2016. Meanwhile he switched to Community Management and now is Community and Academic Program Manager at the company being responsible for user requests and Formula student teams all over the world. Formula student is a name for design competitions for teams of students constructing racing cars. SimScale is a cloud-based platform that gives instant access to computational fluid dynamics (CFD) and finite element analysis (FEA) simulation technology, helping engineers and designers to easily test performance, optimize durability or improve efficiency of their design. SimScale is accessible from a standard web browser and from any computer, eliminating the hurdles that accompany traditional simulation tools: high installation costs, licensing fees, deployment of high-performance computing hardware, and required updates and maintenance. Via the platform, several state-of-the-art open solvers are made available like,e.g., OpenFOAM and Meshing with SnappyHexMesh. More information about the packages being used can be found at https://www.simscale.com/open-source/ . On top of having easier access to open source software, the connected user forum is very active and helps everybody to enter the field even as a person without experience. Founded in 2012 in Munich (Germany), nowadays SimScale is an integral part of the design validation process for many companies worldwide and individual users. It is mainly used by product designers and engineers working in Architecture, Engineering & Construction or Heating, Ventilation & Air-Conditioning. Also in the Electronics, Consumer Goods and Packaging and Containers industries SimScale is useful for testing and optimizing designs in the early development stages. SimScale offers pricing plans that can be customized, from independent professionals to SMEs and multinational companies. The Community plan makes it possible to use SimScale for free, with 3000 core hours/year using up to 16 cloud computing cores. S. Pope: Turbulent Flows. Cambridge University Press, 2000. P. Sagaut, C. Cambon: Homogeneous Turbulence Dynamics. Cambridge University Press, 2008. 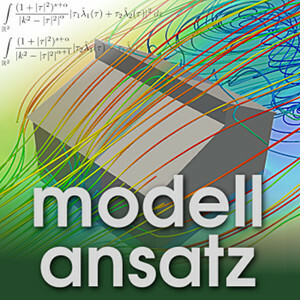 G. Thäter, M. Hofmanová: Turbulence, Gespräch im Modellansatz Podcast, Folge 155, Fakultät für Mathematik, Karlsruher Institut für Technologie (KIT), 2018. P. Allinger, N. Stockelkamp, G. Thäter: Strukturoptimierung, Gespräch im Modellansatz Podcast, Folge 53, Fakultät für Mathematik, Karlsruher Institut für Technologie (KIT), 2015.